The M10-P ASC 100 Edition from Leica should be a tool for filmmakers – even if it does not record videos, but only photos. The camera is sold together with the Leica Summicron-M 1: 2/35 ASPH lens and can use two authentic cinema looks in photos: the classic 35 mm analog film and the appearance of modern digital productions. In addition, aspect ratios of the cinema can be displayed as frames in Live View mode. 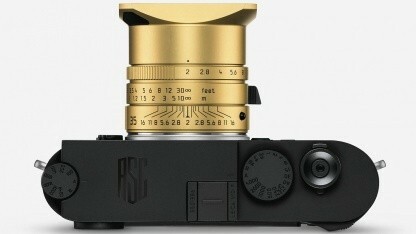 The package contains a clip-on viewfinder and the Leica M-PL-Mount adapter, with which cinema lenses can be connected to the camera. This is how scenes can be inspected before shooting through any desired lens. Like the M10, the M10-P has a 24MP CMOS sensor with an ISO range of 100 to 50,000 and a 3-inch screen with a resolution of 1.04 million pixels. It is protected from scratches by gorilla glass. In addition, WLAN comes. Unlike most digital cameras, the M10-P does not contain autofocus. The manual focus also works differently than normal. The user must use the lens ring in the viewfinder to adjust two images to focus. This should work faster and more accurately than with the conventional method. However, Leica made an improvement in the M10 and increased the field of view by 30 percent and the magnification to 0.73-fold. The user can continuously take pictures with the Leica M10-P with up to five photos per second. The 2 GB RAM records up to 30 recordings in DNG format or more than 100 recordings in JPG format before the camera has to transfer the photos to the memory card. The Leica M10-P ASC 100 Edition is expected to be available from autumn 2019. So far, the company has not announced a price. For orientation: the normal M10-P costs without a lens are already 7,500 euros.